Dogs are truly amazing creatures. They have very good hearing, their sense of smell is excellent, and boy can they run fast! But did you know that even the simple action of a dog drinking is fascinating too? I’m sure you’ve observed how dogs drink water. It looks kinda tiring. Imagine humans drinking water like dogs do. We have to stick our tongue in and out for a couple of times just to quench our thirst! But do you know exactly what happens when a dog is drinking water? Well this video will open your eyes to what really goes on each time they dip their tongues in the water. Actually, it’s more than just dipping! 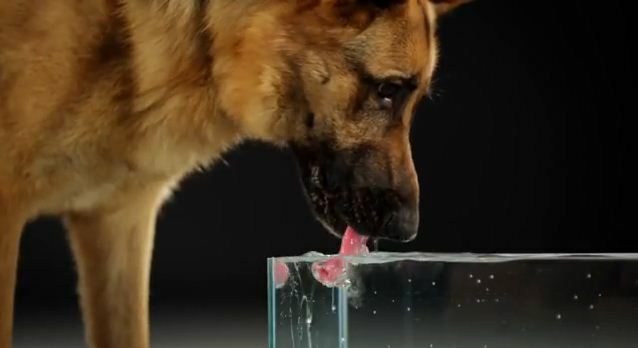 At 1000 frames per second, this slow motion video will show you how a dog’s tongue works when drinking water! Wasn’t that amazing? The dog’s tongue goes into the water, and scoops some out, and it creates a wave of water which the dog catches with his mouth! Simply incredible!